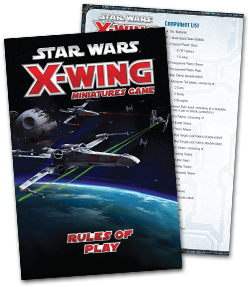 Fantasy Flight Games has put up online the full X-Wing Miniatures rulebook along with the tourney rules over on their website. The Star Wars: X-Wing™ Miniatures Game is coming, and its release will give players worldwide the opportunity command Rebel and Imperial pilots in dramatic dogfights! Over the past several weeks, we’ve shared previews of the game’s high-speed space combat and stunning miniatures. Now we’re pleased to say that the X-Wing rulebook (pdf, 12.6 MB) is available for download on the game’s support page!